Place kefir grains in milk (any kind but I like whole milk, makes my kefir fat and happy) in a GLASS jar. Cover with paper towel. I use a rubber band to hold it on glass. You can also put a lid on it. Set on the COUNTER, not in the window, for about 24 hours. Next day, stir bottle, then strain through plastic strainer or colander into a bowl. Give milk to the plants. Place grains back in glass, cover and set on counter. Repeat for about four-five days. The grains should get fatter and turn yellowish white. They become soft. 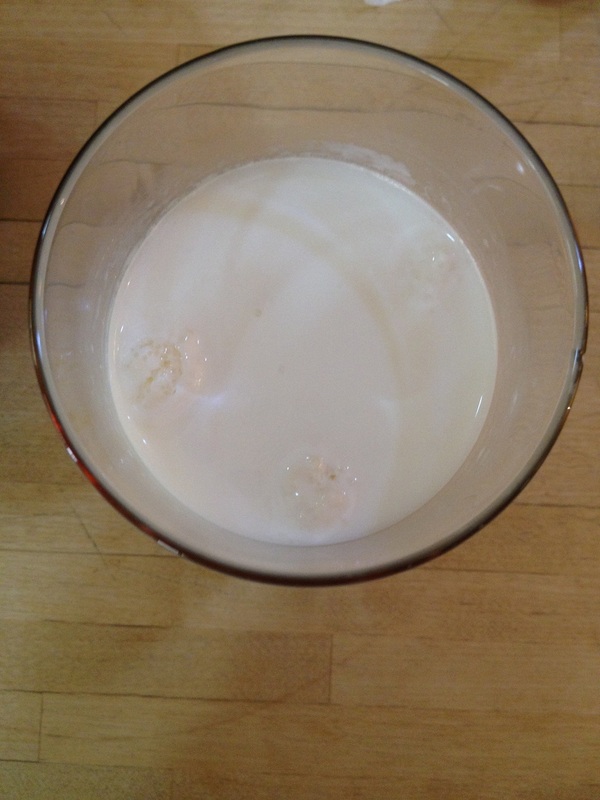 Place kefir grains in glass with milk, almond milk, soy milk, coconut milk or water with sugar. Ratio about 1 part Kefir to 6-8 parts milk, or approx. 1 TBL to 1/2 Cup milk. Set glass on counter out of direct sunlight. Leave for 24 hours. During this time, kefir eats milk sugars. Time it takes to ferment depends on the temperature. Warmer (summer) is faster. Winter is cooler, slower. After 24 hours, milk will smell fermented, a bit sour, like Greek yogurt. I usually stir it. 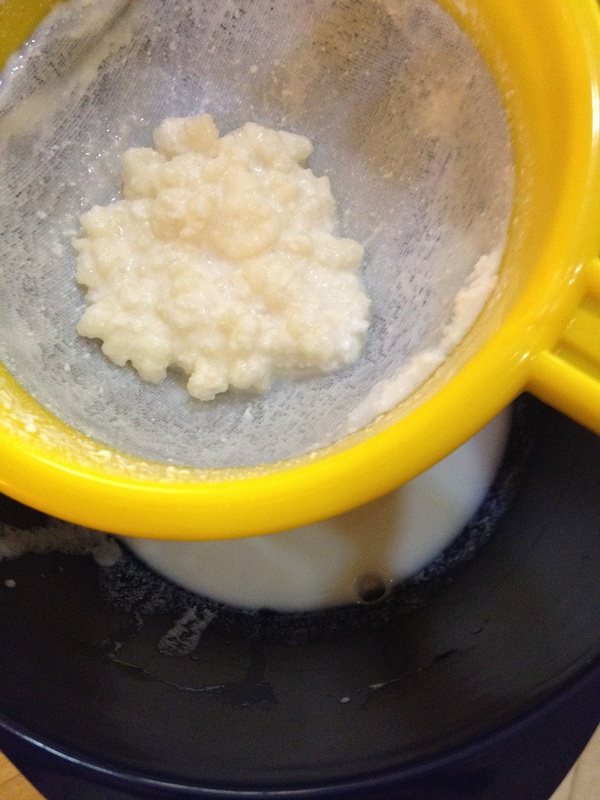 Using a plastic strainer, pour milk through strainer into a bowl, leaving kefir grains. If the milk has really separated into curds and whey, I strain 2-3 times. The milk you drink, the kefir grains you use again. That’s it. REPEAT for tomorrow. Start slowly. If you have no issues with milk, drink about ½ cup a day. I drink more than a cup both in the morning and the evening. Your waste will likely change (click here to see what a healthy stool should be). Your gut will change over the months. Although you might notice a difference in a week or two. Kefir is living bacteria. It will die if HEATED including putting it into a hot glass from dishwasher or if it is not fed. It does not need a bath. 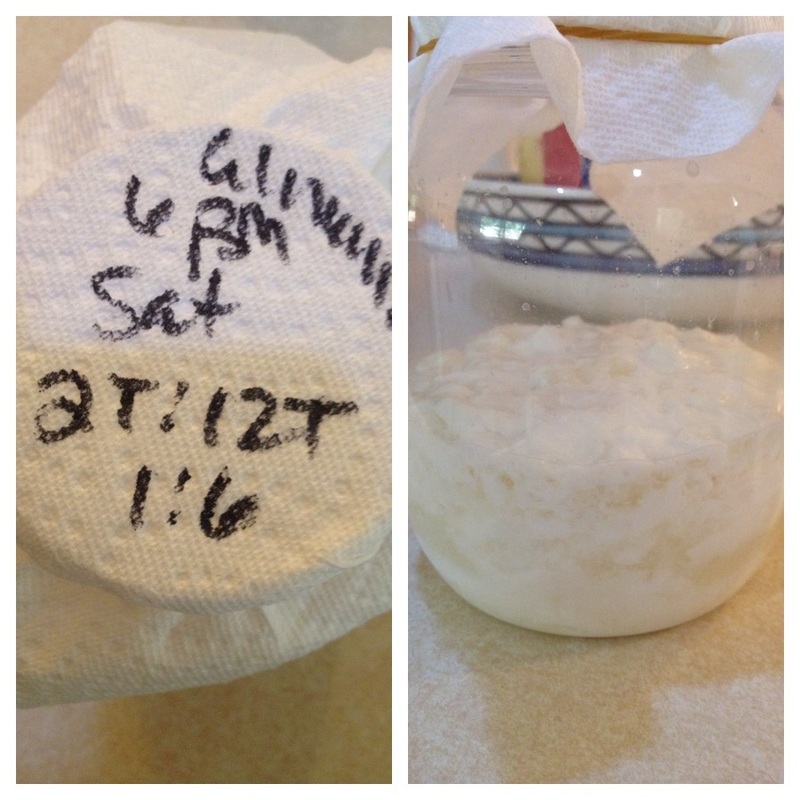 DO NOT WASH your kefir grains with water. You can freeze kefir grains. Or place kefir with milk in refrigerator when you need a break. You can dry it for another day. Or take the grains on vacation with you and make kefir as you travel. Kefir milk has 35-55 good bacteria strains. Store-bought, probiotic yogurt has about 8-12. DISCLAIMER: I am not a physician or a nutritionist. I am simply sharing what I know and practice in my own life. I am not suggesting I know the answer to your health issues. Kefir is simply one of the many foods I use to maintain my health. If you have any or chronic health issues, I suggest you confer with your doctor first. Where can I get a few tbs of grains to start in bahrain? Can you please share with me some kafeer if you are still in Bahrain? I am even happy yo pay for it as i really need it so badly for my digestion and gut issues.Please reply back where we can meet (i have a car) and if it is possible.